On Feb. 1, 2013, Iran unveiled its indigenous fighter jet named "Qaher 313″. The prototype of the Q-313 (or F-313 according to the stencils applied to the aircraft), was presented to President Mahmoud Ahmadinejad and publicly displayed as part of the Ten-Day Dawn ceremonies held in Iran to celebrate the 1979′s victory of the Islamic Revolution. In the previous days, the Iranian Defense Minister Brigadier General Ahmad Vahidi had said, "The aircraft will be different from the other fighter jets Iran has already made." 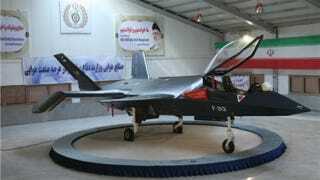 Iran's new fighter jet doesn't look like any we've ever seen before. Turns out, as The Aviationist explains, that's because it maybe possibly almost definitely can't fly. Indeed, based on the first photographs released by the FARS News Agency, the new stealthy jet has a really peculiar design. It features hard edges and those distinctive edges and angle of the U.S. F-22 and the twin tail shape much similar to that of the F-35 Lightning II. The Q-313 has large, seemingly fixed canards, and little wings whose external section is canted downward. The canopy material is at least odd (based on its transparency, it looks like plexiglass or something like that). The nose section is so small almost no radar could fit in it. The air intakes are extremely small (they remind those of current drones/unmanned combat aerial vehicles) whereas the engine section lacks any kind of nozzle: engine afterburners could melt the entire jet. And, above all, the aircraft is way to small. Look at the following image showing an Iranian officer sitting on the ejection seat in the cockpit. It looks like this pilot is in a miniature plane. Summing up: the shape is interesting with some innovative features but the Q-313 displayed on Feb. 1, 2013, seems to be nothing more than a large mock up model (not properly sized to accommodate a real pilot….). There is a video allegedly showing the Q-313 in the air. Here it is. Even if it is not the first flight of the aircraft as some of The Aviationist readers say, the way the depicted plane flies is suspect. It seems a radio-controlled scale model more than a modern fighter jet. Furthermore, as someone pointed out: if the Qaher 313 actually flew, most probably Tehran would release footage of its takeoff and landing.